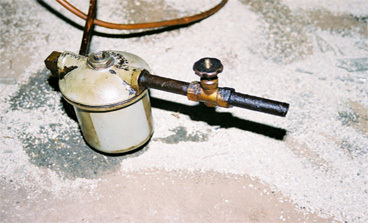 OIL SPILLS CAN RESULT IN FIRES AND DAMAGE TO HOUSEHOLD CONTENTS. Oil spills can cause fires and destroy furniture and storage items in its path. 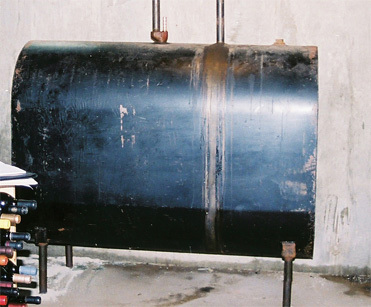 Ruptured tanks such as this can be caused by age, homeowner neglect, service company errors, overfilling, manufacturing defects, heating system malfunction, and more. ISE offers Protective Inspection Procedures to assure homes are in compliance with the Chapter 453 directives concerning leaking oil lines and tanks. Please read our Compliance Bulletin. 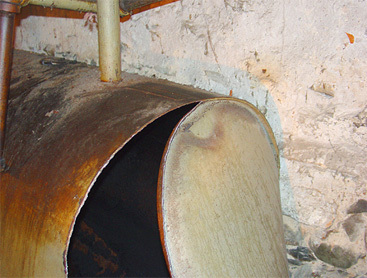 Oil spills can result in the contamination of the basement. Such spills are a safety hazard since fuel oil is combustible. Cleanup of an oil spill in the basement or other parts of the house can be extremely costly. ISE's Protective Inspection Procedures can prevent the occurrence of such disasters. In the event of an oil spill, homeowners need to contact their local fire departments and state offices of the Department of Environmental Protection. These responders are critical to ensuring the safety of the home and its residents. ISE has the experience and the tools to help prevent leaks from happening. But if they do occur, we are also there to investigate the incident and determine the exact cause of failure.